Asking your girlfriend for her hand in marriage is a huge step for any man. This all-important question has life changing implications, and will represent a turning point in your life. It is a moment that both of you will remember and cherish forever, and it will be a positive memory in which to reflect later. Choosing the right ring for this question of a lifetime doesn’t have to be mysterious or difficult. There are many engagement rings on the market, and choosing one can seem like an overwhelming task. Deciding on a style, size of diamond and color are important factors in making this huge purchase. While many choose a pre-designed ring, it is more personal to select and build your own engagement ring. Building your own engagement ring will make you feel more empowered about the process and ensure that your fiancée will adore the ring you ultimately choose for her. The first step in building your own engagement ring is deciding on a budget for your purchase. There is a conventional standard that a man should expect to spend two months’ salary on the purchase of the engagement ring. This figure is not set in stone. (Pun intended) This is widely accepted, but will vary, depending on the individual circumstances. Diamonds come in a range of prices, and the options you choose will ultimately have the greatest effect on the price of your ring. Diamonds can range in price from several hundred dollars to tens of thousands. Other factors, such as type of gold, setting of diamond and number of diamonds will have an effect on your price as well. Carefully examine your budget before deciding on a diamond setting for your ring. You certainly don’t want to fall in love with a ring, only to discover that it’s outside of your budget. Building your own engagement ring will more than likely cost more than purchasing a ready made ring. Building your own ring allows you to personalize your purchase, selecting the options that you know your fiancée will love. She will appreciate the gesture as an extension of your love for her. Despite the higher price tag, building your own engagement ring is a more attractive option for that all-important purchase, because it shows that you have made careful and thoughtful decisions based on your knowledge of your girlfriend’s tastes and preferences. By building your own engagement ring, you have taken the initiative to select a ring that is reflective of her personality and style, rather than a cookie cutter choice of engagement ring. Adding small touches such as a personalized inscription or names to the ring adds yet another unique dimension of personalization to your engagement ring. The cut is the most important element in choosing your diamond. Diamonds sparkle and shimmer because of the process of cutting and polishing them to allow for maximum reflection of light. Quality cut diamonds will offer the most sparkle as they are cut finely for this purpose. Choosing your cut of diamond is the first step in selecting your diamond for your engagement ring. Avoid diamonds with less than desirable cuts, such as diamonds that are cut too shallow or too deeply. Remember that the width and depth of the diamond determines the overall brilliance of the diamond. Stones that are cut to shallow are said to have a “fisheye” appearance, appearing watery, glassy and dark. Stones that are cut too deeply are described as having a “nailhead” characteristic, with a center that appears dark. The color of your diamond is an important part of the ring purchase, as variances in color are noticeable to the naked eye, and can cheapen the appearance of your ring. Diamonds range in color from colorless to a yellow hue. Ideally, your diamond should be as colorless as possible, similar to the look of glass or water. 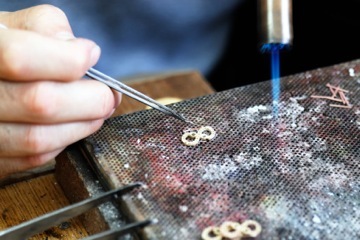 Work with a trained jeweler to ensure your diamond’s color is of the highest quality possible. The clarity of a diamond is measured by the number of imperfections or “inclusions” are present in the stone. These inclusions stem from variations and blemishes that originate in the rock from which the diamond was mined. The highest quality diamond will be clear with few nicks or inclusions that are noticeable to the trained eye. Carat refers to the weight by which all gems are measured. Each carat is divided into 100 points. These points determine the size and heft of your diamond. Choosing the right amount of carats for your ring will determine mainly on budget and personal preference. When deciding on how many carats to purchase for your bride to be, consider the size of her hands. Smaller carat weight diamonds work best with women who are petite in stature with small hands. While it may be tempting to purchase the largest carat diamond in your budget, consider the functionality of the ring. Will this be something your wife will be comfortable wearing on a daily basis? Will she be comfortable wearing her ring to the grocery store or to change diapers? Take these factors into consideration when making your diamond purchase. Now that you’ve decided on your diamond, it’s time to choose a setting. The setting refers to the prongs that hold your diamond in place, and are also called the head of the ring. Setting can also refer to the band on which the head sits. There are several settings to choose from when building your engagement ring. The most popular of settings, the solitaire has several prongs that hold one single diamond. This setting allows for maximum brilliance and has a dramatic look when paired with the right stone. This setting pairs complementary diamonds on the sides of your main diamond for a more dramatic look. Choose a smaller diamond that will bring out the brilliance of your main stone or stones for an elegant appearance. Pair your main diamond with a colored gemstone accent. This can be a reflection of your girlfriend’s individual preferences. Choose from rubies, garnets, or a pink or blue sapphire. A knowledgeable jeweler can assist you with choosing the right gemstone to accent your ring. With your diamond and setting firmly in place, you will need to decide on the metal for your band. Yellow gold is the traditional color of engagement ring, however, there are many options available to you in this department. Yellow gold often pairs well with darker skin tones, and makes a perfect accent for darker gemstone settings. For a more contemporary look, consider a platinum or white gold metal for your ring. Platinum is a pure white metal which does not wear away easily. It is resistant to scratches and nicks and will stand the test of time. Its durability makes it an excellent choice for your ring purchase. Similar to the look of platinum, white gold is a more affordable alternative for your ring’s band. White gold is easy to repair and polish, and will last for long periods of time. White gold is a mixture of gold and other alloys, and is treated with rhodium to give it its white luster. 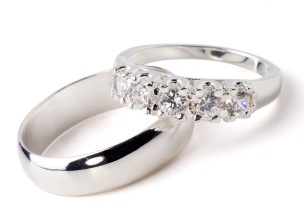 Over time, the rhodium may wear off, requiring your ring to be re-plated to restore its shine. There are several places where you can purchase your custom built engagement ring. The majority of couples turn to large chains to find their perfect ring. The advantage to shopping with large chain retailers is their expertise and support system that will guide you through your purchase. Another option is to purchase your ring with an online jeweler. Purchasing your ring from an online jeweler gives you the advantage of being able to “shop” for your ring before making your actual purchase. You can compare prices, build options and add features to your ring, all from the comfort of your home. Will She Like This Ring? Some couples opt to choose engagement rings together, with both the man and the woman making the ultimate decision about the ring. This is a great option if you are not interested in surprising her with the ring. This will ensure that you will purchase the ring she desires. Many men want their proposal to be a surprise and choose to buy the ring without the woman present. Rest assured that by taking her preferences into account, your ring will be well received by your future wife. She will appreciate your thoughtfulness in building and choosing the right ring, and she will adore the ring even more. To find the best deal for your ring, consider shopping in the off season. Many weddings take place from June-October, making January-March prime ring-buying season. Avoid buying your ring during this period. Wait until mid-summer when fewer people are purchasing engagement rings. Also avoid holiday periods that are closely linked with marriage proposals, such as Valentine’s day and Christmas. Building your own engagement ring for your bride to be is a great idea for the man looking to make his proposal special and memorable. The key to making a successful purchase is to educate yourself about the options available to you, and to make a choice based on your knowledge of your girlfriend’s preferences. Building the perfect engagement ring is a large undertaking, but with preparation and knowledge, you will choose a ring that will knock her socks off.